Did I just hear a rooster crow?! My ears must be playing tricks on me. Here I am on a bright May morning, standing on Abington Avenue in Newark, right in front of Abington Avenue Grammar School—getting ready to go inside and talk about invention to the 8th graders; and I swear I just heard a rooster crow…….not possible. Again, I hear this rooster. Perhaps I have been working too hard? There he is, right across the street, standing on a little table greeting the sun, and obeying his genetic code. Well, I’ll be. I haven’t heard a rooster crow in the city in…….well…..a very long time. This is where my out-of-body experience takes place. My mind leaves my somewhat stupefied body and heads down Abington Avenue towards the old Dugan Bakery and hooks a right onto North 4th Street. There, it makes its way toward 1st Avenue, to my original Newark home. As I mentally pass familiar neighborhood houses, I see the old sights again…….grape vines; vegetable gardens with big ripe tomatoes on the plants; fig trees; and the old Pedone house where all three items grew; and my mind faithfully re-draws their ancient brown-wooded chicken coops. That crowing rooster is taking me all the way back……. when yards were miniature farms and it was not uncommon for folks to raise chickens, pigeons, and small plot crops. I plainly remember seeing fattened chickens being slaughtered for special dinners, and once even a pig roasted in a dug out open pit. I can almost feel the big, sticky, fig leaves;….. or smell the tomato plant vines nourishing those plump, red tomatoes that many families would cook and can come the Fall---enjoying wondrous fresh gravy during the cold months. I remember sitting and playing cards in the cool shade of a grape vine arbor, pendulous with sweet purple grapes just begging to be picked. Those little backyard farms and quiet arbor nooks in my old Newark neighborhood, were there to help support your family, yielding seasonal delights; and keeping your heritage alive. Newark was a city of immigrants, holding on to an agrarian past with one hand, and reaching out to an urban future. Our yards reflected our lives, part past and part future---vegetable gardens and play swing sets; grape arbors and television sets; fig trees and V-8 engines in our cars. We lived a life of in-betweens and it was fun. Our grandparents spoke broken English and our parents spoke both English and Italian. We went to high school and took Italian classes for our foreign language requirements…..and soon learned, much to our surprise, it was a bit different from the local language dialects our grandparents and parents had been taught from birth. Our grandparents marveled at how fast we adapted to the avalanche of modern gadgets and toys that flooded the 1950s home; and we all gazed wide eyed as color TV sets made their appearance. Walt Disney made us smile and cry every Sunday night. But the old customs found a way to thrive, if in miniature. Our neighbors, the Lucadamas’ had this lovely grape vine that filled the fence between our yards. How I loved to run my hands along the new Spring shoots and leaves that came from that fast growing plant. One Fall they cut the old vine back hard; and I watched as its sap spilled out of the cut fat stump….. like lifeblood pouring out onto the ground. I cried and told my father the beautiful plant had died. He said I would get a surprise next Spring, and I did, as it roared back to life. My old backyard also taught me about life. Families grew their grapes in a variety of ways. They might have grown the grapes in short rows like the vineyards do; maybe along a big fence; or some used the arbor technique, my personal favorite. Four metal poles were staked out and sunk into the ground in a big square or rectangle pattern. The upright poles went up about 7 feet or so and then spread out into a roof or gabled arrangement of pipes. At the base of each upright pole, a grape vine plant was located, and lovingly nourished to grow. Some fine chicken wire went up the sides so the grapevine tendrils could grab and pull themselves upward. Some folks used twine or cord stretched from the ground rather than the chicken wire. There was no sure fire method. Each backyard farmer developed his own style. It was an opportunity to learn and experiment. In late summer, neighborhood grandfathers sat under the arbors to escape the heat, sip wine, play cards, and talk in the old tongue. Usually an old kitchen table, maybe one with a white porcelain or Formica top, with flip up sides, complete with an accompaniment of creaky wooden chairs, served as the gathering place to pass the time, discuss the news, read letters, play with grandchildren, and perhaps recount old glories. Here in this outdoor living room, the old would pass to the young an oral history, treasured customs, and tales of the old country. I can imagine this summer evening scene being played out all over the neighborhood, with candles for light, maybe a little soft radio music in the background. A little food, a little wine, and a little culture right there in your grandmother’s backyard. I learned how to play the popular Italian card game Briscola (Brisc) under a neighbor’s grape arbor. Watching the animated old men cuss and bluff their way through the happy game was as much fun as trying to master the rules. I played that game with my Newark and Belleville classmates during many lunch breaks while at the Newark College of Engineering. They too learned the game from their grandfathers and neighborhood men. The lessons stay with you, like the smell of the grapes, on those muggy, oppressive August days. And when the grapes ripened in the tangy, chilly, early Autumn air, they would be processed and fermented into wine right in your basement; and the revered grape vines carefully pruned back and prepared to weather the winter winds and snow. The cycles of life came and went in our backyards. Sweet figs were in abundance too. The trees were especially easy to see, not in the summer, but in the Fall and Winter. Well, you didn’t actually see them as much as you saw their protection. You could protect your fig trees in one of two basic ways. Bend the usually supple tree over and bury it in a dirt trench and pack it with lots of good earth and hay to protect it from the winter frost. The most prevalent method in my old neighborhood was to wrap the tree in a cylinder of protective, and water-proof materials. Over the years, I have seen a variety of techniques used. Black roofing paper, linoleum, plastics…..materials on-hand adapted for the job. Some folks wrapped their fig trees in old blankets and bedspreads first, then applied the tar paper/linoleum and capped it off with a plastic top. Rope and strong tape was used to keep the whole structure from unwrapping. These homegrown scarecrows dotted the neighborhood yards. I must say, I remember that the linoleum used for the protective fig tree coating always seemed to be either a green leaf swirl design, or a red rose kind of motif. I don’t know if this was some unwritten law of the neighborhoods, but maybe most folks preferred that style for their homes and when it got suitably worn-out, it did double duty around the fig trees. For a friend’s tree, I used the linoleum technique, packing the inside of the scarecrow covering with dry maple and oak leaves for insulation. It worked quite well. Some very sweet figs came out of that tree. Always had to shoo the ants away. 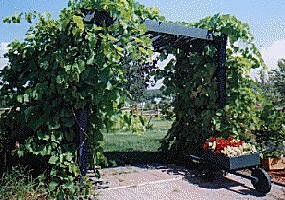 Her yard had an arbor grape vine too. First thing I did when I got my own house was to grow tomato plants. Neighbors used to kid me, saying it was in my Italian genes. They were probably right, but those luscious red vegetables bring the old Newark neighborhood back to me. All those dried out sticks protruding out of a plot of land are a clear sign a tomato garden lurks within. Every now and then I see a few old-timers still clinging to the backyard soil, but certainly not as many as I remember in my early memories. That old rooster crows yet another time, snapping my mind back inside my body. I blink my eyes to sort of set the whole mind-body thing back into sync again. As I head for the front door of the school, I remember kindergarten class over 45 years ago, when Mom left me there with my teacher, gentle Mrs. Fogarty. Her lilac perfume and gray hair still fresh in my memory. I wonder how many kids today will have the cherished memories I have of that neighborhood, that school, and the streets---how many will remember, and want to remember, the many details of their childhood. Perhaps some will find the adventure I found in my backyard. And maybe in the future, a crowing rooster will take them back in time as this one did to me this splendid Spring morning. After I finished talking to the kids, I pointed the car back down Abington Avenue, and cruised the old neighborhood. Not many gardens I could see, but most of the houses are still there; just like my memories.